Help! My YouTube videos are not ranking even though I am optimizing my title, description, and tags! Do you have some videos up on YouTube but they’re just not pulling any good rankings in Google and not getting you any extra leads? It’s a pretty darn common frustration people have after seeing other peoples videos ranking #1 for a keyword phrase for motivated sellers, buyers, or tenants… and they thought they did everything right and their video is stuck on page 3 (or nowhere at all). It was frustrating to know as I was following “all the steps” but just couldn’t get any of my videos to pop up onto page 1 in Google. Soon after, I began to realize that it wasn’t that I was doing anything wrong – I just wasn’t doing enough to fully optimize my YouTube videos. Especially if I was trying to rank for a very competitive keyword phrase in a highly competitive real estate market. Phrases like “sell my house fast Fresno”… phrases people are typing in every day to find a solution to their problem… but tons of other investors and real estate agents were also trying to get in front of them in Google with their own websites and videos. In this article, I am going to give you some simple ways to add layers of optimization for your YouTube videos so you can increase your rankings in the YouTube and Google search engines…. … so you can add that extra online asset to help you grab more traffic, leads, and close more deals. Once I learned the basics of YouTube video marketing and optimization… I’ve learned other more advanced ways to get my YouTube videos ranked higher in Google (and to generate more leads and deals in turn). 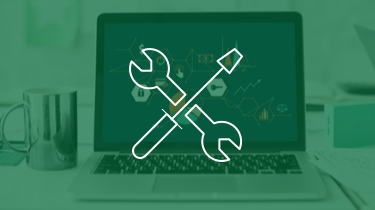 Note: Adding layers of optimization is assuming you have also optimized your videos with the Title, Description, and Tags which is the foundation of your video optimization. One thing to understand when Google indexes YouTube videos, they don’t know what your video is about unless you give them that info. Google is only able to crawl content based on text. By understanding that, here are some ways to give them that text they can crawl. 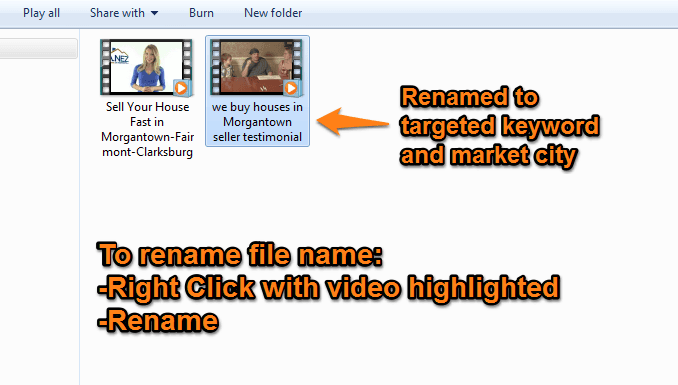 Using the same video file as my example in the image below, you will see how I changed the video file name from the default filename my video camera gave to the video… to a filename that now includes my targeted keyword and market city. Then I re-uploaded the video to YouTube to replace the “old” one with this new better optimized video file. By naming your video file to include your keyword phrase and target location / city, you are able to let Google know what the video is about a little bit more than before. See The Difference? If you can now have a better idea of what the video is about without watching the video, so will Google. Helping Google know what your videos and pictures are about helps it have a better idea of what your video is about. Pretty simple eh :) Now you can upload the video! Tip: I teach in the 3LPD training for InvestorCarrot members what your upload settings should be before uploading any video, check it out! YouTube is pretty darn smart these days. But it always helps to give YouTube and Google information so there’s no guessing what is in your video. A really slick tip is to make sure that you use your keyword phrases in the actual words spoken in your videos and turn that into written text that you can submit to YouTube as the “Closed Caption” text for the video. By doing this, you are doing 2 things that’ll make your videos more effective. FIRST, Not directly related to SEO or ranking your video, you are laser-focusing your content on your targeted location and the benefit you can help the person watching your video with, which will help make your video more effective in getting the viewer to take that next action to work with you. If you have apartments for rent in Santa Fe, use the words “apartments in Santa Fe New Mexico” in the voice over on your video (because that’s a popular phrase people are likely typing into Google who are looking for apartments in that area). 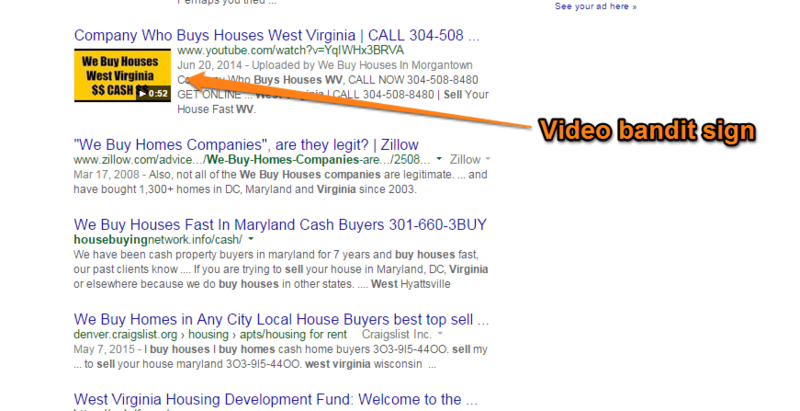 As another example, if you’re a house buyer, your video should communicate you are a “local” buyer. 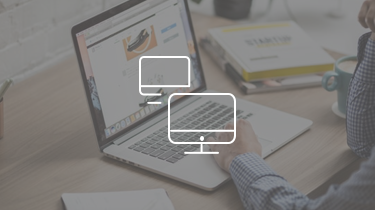 Just as your investor website should communicate you are a local buyer, your YouTube videos should do the same. SECOND, When you add the text for the Closed Caption settings for your videos, you’re giving Google extra content to index and help rank your video. Remember Google doesn’t watch your videos, so it only knows what the video is about based on what we tell it. By using the closed captions feature that YouTube offers and making sure your keyword phrases are spoken in your video som, it will help you rank your YouTube video better in Google. 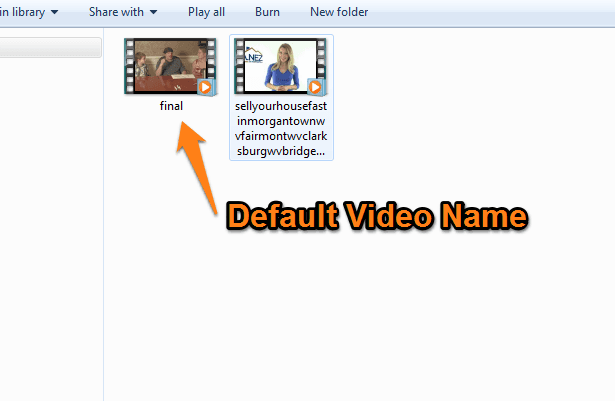 Just as you changed the default video file, you will do the same thing with your custom thumbnail image. But this time, use a secondary keyword phrase in the image file name. Let’s say you made your video file about “we buy houses in Fresno”, a secondary keyword phrase a motivated house seller in Fresno may search for in Google may be, “sell my house fast in Fresno.” So make a variation of that the title of your thumbnail image. Remember you always want to diversify your keywords. Never keyword stuff the same term in your overall YouTube optimization or your website… Google will “reward” you with dropping your rankings. 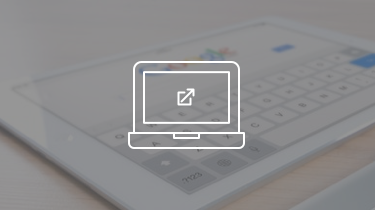 Step 3: See The Difference Online + Get The Potential SEO Boost In The Process! A side benefit you’ll get if you take some time to make sure your custom thumbnail is a visual that is compelling and interesting, is it is almost like you are creating a little bandit sign that grabs peoples attention there in the Google search results… which increases the click through rate of the video and can help increase the ranking of the video as a result. Those 3 quick tips are just 3 of many ways to improve your YouTube video rankings in Google in competitive markets, assuming you’ve already optimized the basics correctly (video title, description, tags, etc.). Social interaction on the video pages – Get people to comment on your videos (so DON’T disable comments! ), FB like, and G+. Google likes seeing interaction and uses that as a way to tell if it’s a quality piece of content or not. “Page Authority” – YouTube already has the highest domain authority possible (which is a good thing), so another way to increase your rankings is by improving the “page authority” of your YouTube video. The “social interaction” tip above can help with that, but so can back links that point to the video, age, and more! Have an active YouTube channel – YouTube will reward channels that are more active. If you have 1 or 2 videos on your channel and your haven’t even added a custom profile image on your YouTube channel, you may want to make your channel more active. Get more videos in there and customize the look and feel of your channel a bit. We dive into these tips plus more in big time detail in our 3 Lead Per Day Training (exclusive to InvestorCarrot members currently). If you’re not yet a member, check out our pricing and plans and come aboard! Take these simple but powerful YouTube video optimization tip into action and watch your videos climb the rankings! I have been active in real estate full time since 2009, it’s been cool to combine my passion for inbound marketing with real estate investing. My kick is helping others find the success that I have had with InvestorCarrot. Thanks Nez! I liked the teaching to rename the video and the thumbnail using primary and secondary keywords. Excellent post. I really like the part covering closed captions. I’ve begun implementing all of these tips into my videos. Thanks for the great content! Let us know how it goes w/ the Youtube optimization. It’s always awesome seeing the results people get after they implement this stuff! Great content Adrian, what is your advise on animated video? Briscoe, animated video is great… but one thing people have to remember is that the type of video isn’t what’s important… it’s whether you’re getting your message across well. The reason the animated videos worked so well when they came out is because they were new, novel, people watched them because of that… and the message is relayed well with the pictures and voiceover together. Great combo. So, the new and novel part has worn off for the most part since you see them everywhere now… but they are still a great way to relay a good message. As always, I love the training detail Investor Carrot offers. Awesome!!! Thanks for the comment Tim and we love you too man! Awesome Larry!!! We’re a fan of you man! Reach out if we can help with anything at all! Thanks for the info! Quick question though? I added CC to a video that was ranking on the first page. Now I can’t find the video at all. Any thoughts on why that would be?